Author: Zelealem Leyew. Series edited by: Hans-Jürgen Sasse †. 14 pp. Roman, 312 pp. Kemant is a dialect of West Agau, which together with its sister languages (North, East and South Agau) forms the central group of Cushitic languages. Nowadays West Agau is spoken only in some regions of Chilga. Among the approximately 172,000 speakers of Agau there remain only about 1,600 native speakers and about 3,500 using Agau as a second language. Because of its decades of contact with the Amharic language dominant in Ethiopia it is today considered an endangered language. The present book is separated into five chapters. 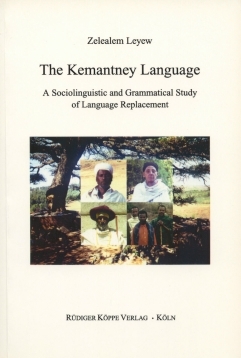 The fist chapter discusses the findings of recent studies on language death and endangered languages, while the second provides the historical, political, economical and social background that led to the substitution of Kemant by Amharic. The third chapter is a socio-linguistic analysis of the language behaviour of the contemporary speakers of Kemant and details their sense of identity. Drawing on known case studies from Africa the possibility of resurrecting the language is discussed. The fourth chapter describes the vocabulary of Kemant, studying both ongoing and already finished linguistic phenomenons, e.g. the substitution of proper names and toponyms, whereas the fifth contains a grammatical analysis of Kemant, dealing with various areas of language structure (phonology, morphology and syntax). The summary enlarges on the present socio-linguistic and linguistic situation of Kemant and points to the future research possibilities of this particular endangered language. Zelealem’s “Kemantney Language” represents an important component of the Kemant’s cultural heritage and is an excellent description of the historical and sociolinguistic development of a language which probably will disappear in its spoken form in the near future. The new monograph on Kemantney represents a valuable and modern description of one of the Agaw languages, which faces definitive extinction. Especially from this point of view the sociolinguistic approach of the author seems to be very fruitful.